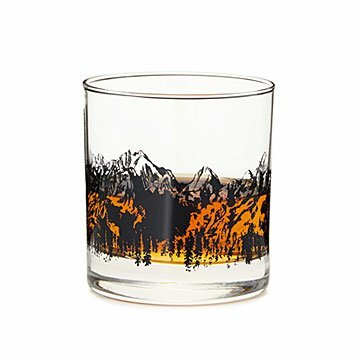 Fill it with your favorite whiskey and, like a sunset or sunrise, mountains and forest appear. Sipping spirits is always better under the stars, and this glass makes us excited to head outside with our favorite single malt. As you fill it, mountains and forest appear as if during a sunset or sunrise (depending on where the night takes you. Kevin and Ginny Davis start with a sketch or photo—usually from a backpacking trip—then hand print the image using a manual press. Finally, they fire it to set the ink and make the glass dishwasher safe. The clever design makes a great gift for the nature—and nightcap—lover. Created in Estes Park, Colorado. Glasses made in the US. Kevin and Ginny Davis were both born in Colorado and grew up spending most of their free time outside. When they're not working together, they're backpacking and camping together. But Kevin and Ginny are kind of always working, taking notes and photographing landscapes as they explore Colorado's majestic landscape. "Our passion for the wilderness and the outdoors," they say, "is something we want to share with others." My husband is from Colorado and misses the mountain views. Now he can enjoy one in his hand while sipping on a favorite beverage. Perfect combination of enjoyment and beautifully made!